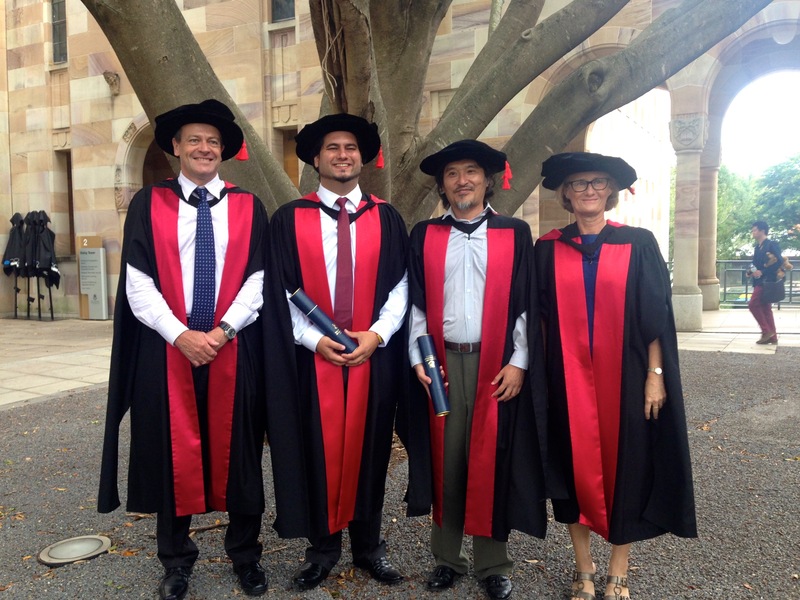 Congratulations to Carlos Bustamante, Jenny Giles and Tom Kashiwagi who received their PhD degrees at the University of Queensland in December 2014. These three PhD students have collectively made a huge contribution to the work of the Molecular Fisheries Laboratory. The conservation and fisheries status of shark and ray populations in Indonesia, Japan and Chile has been clarified and enhanced as a result of their work. Jenny is working at the Northwest Fisheries Science Centre (NOAA) in Seattle, Tom will join Professor Ed Heist’s group at the University of Southern Illinois (US) and Carlos with continue to work with MFL over next three years as a UQ-funded postdoctoral fellow. L to R: Professor Mike Bennet, Dr Carlos Bustamante, Dr Tom Kashiwagi and Principal Research Fellow, Dr Jenny Ovenden.